Our second year that the Arboretum’s Spring Show! UofM Landscape Arboretum’s Spring Flower Show – Passport to Spring, and Conservatory Craftsmen! In 2018, Conservatory Craftsmen custom-designed an English-style conservatory for the Minnesota Landscape Arboretum “Fragrances of Spring” flower show. It was a hit with visitors, and we heard from so many guests who enjoyed seeing the kind of work we do. This year, we created a European glass garden house as the centerpiece of the 2019 Arboretum spring flower show that runs Feb 1 through March 3, 2019. It will occupy the center of the Great Hall, and be surrounded by showpiece gardens of plants and themes from around the world. The great country houses of Europe are known for their elegant formal gardens, but they were also hard-working estates that were self-sustaining, growing the herbs, fruit, and vegetables for kitchens that often had to feed many guests as well as the resident family. To produce herbs for seasoning and for medicinal purposes, as well as shelter tender seedlings early in the growing season, practical workspaces for gardeners were found in glass houses. These practical structures were typically positioned near the kitchen, to make snipping basil and chives easier, and often featured cold frame growing beds attached or nearby, to accommodate more plants. At the 2018 Chelsea Flower Show in London, MaryJo and I (Jim Hewitt) were inspired by not only the fantastic floral displays over three acres, but the focus on sustainability and eco-friendly growing techniques. You can read the blog on our trip here for more info. Greenhouses and glass houses offer tremendous potential for the home-owner. We built this year’s glass house for the Arboretum flower show as a fairly authentic European kitchen garden. If we were to build this for a customer with all the technology we commonly use, the windows would operate on temperature controls, the blinds would fold up or down based on the time of day or amount of sunlight, and there would be automatic supplemental heating and an automatic fan. To inspire your own kitchen garden, we created an Arboretum flower show takeaway. King Charlemagne famously specified specific plants for healing and herbs for health and cooking, and we’ve listed some of his favorites—you’ll see many of them at the Arboretum! Come tour our glass house in the Great Hall at the Minnesota Landscape Arboretum! Next year, we are excited to announce that we will again be working with the Minnesota Landscape Arboretum to create an inspirational and unique glass structure for the garden. Stay tuned to see what develops! https://conservatorycraftsmen.com/wp-content/uploads/2018/12/French-Garden-Shed-Exterior-1.jpg 1003 1600 Conservatory Craftsmen https://conservatorycraftsmen.com/wp-content/uploads/2017/11/conservatory-craftsmen-white-logo.png Conservatory Craftsmen2019-01-22 20:50:202019-01-22 20:55:45Our second year that the Arboretum's Spring Show! When people talk about expanding interior space, they immediately think about taking down walls and building new rooms. These are plausible solutions, but only if your plot of land can accommodate the extra floor space. If your property is in the middle of the city, however, or if you like your structure as is, then you might want to turn your gaze upward. Conservatory Craftsmen offers an opportunity to expand your interior space without doing any major renovations. By building a rooftop conservatory or greenhouse, we add one more inhabitable space to your property. Rooftop conservatories designed by Conservatory Craftsmen have sustainable features that are trendy today: energy-efficient, automated, and eco-friendly. Although they are still more popular in the UK, more American homeowners are starting to see their benefits and are now integrating conservatories into their homes. With their glass walls and roofs, conservatories allow natural light to come in. Conservatory Craftsmen also adds large glass doors and windows that open either manually or automatically. As a result, the houses we work on become bright and airy even if their owners keep the lights and air conditioning off during the day. So, they get to enjoy the outdoors without stepping outside their homes and save on electricity bills. Whether you use it as a greenhouse or a sunroom, a rooftop conservatory offers comforts and efficiencies that appeal to your modern sensibilities. Rooftop conservatories are flexible; commercial property owners can find multiple uses for them. They are suitable as an events space, for example, or as structural covers for hotel rooftop swimming pools. Other possible uses for them are as art studios, dance studios, and cafe lounges. Food establishments and fresh produce stores can also take advantage of their rooftop spaces by converting them into commercial greenhouses. They can grow some of the products they sell or use in their dishes. 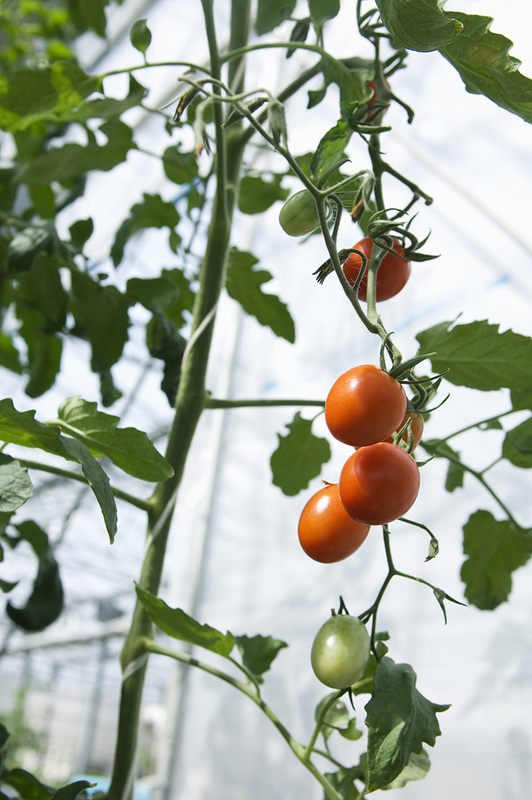 A commercial greenhouse can be a selling point for health-conscious consumers and supporters of sustainable farming. 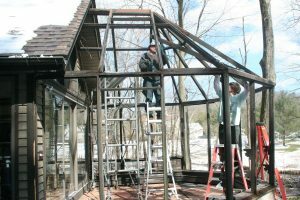 One of the specialties of Conservatory Craftsmen is commercial greenhouse construction, so if the idea above appeals to you, you’re already in the right place. Automation is the mark of a modern conservatory, and it is a luxury that’s worth spending on. Fully-automated conservatories boast self-closing roof blinds that are heat-activated. Once the interior reaches a specific temperature, the system triggers the blinds to extend across the glass roof. Automated windows work the same way. With the addition of a rain detector, you don’t have to run up to the conservatory and pull the windows closed if it rains. Conservatory Craftsmen offers these features, including remote automation which allows you to control automation settings from your smartphone or through a voice-controlled speaker. We do our best to maximize technology to give you something extra. Why settle for plain additional space when you can have it plus modern luxuries? If this sounds good to you, let’s talk. Get in touch with Conservatory Craftsmen today. What could possibly be the connection between these two things? Well, here’s the story. A few years back, Conservatory Craftsmen was commissioned to add a new conservatory/orangery onto the carriage house of the old Naval Hospital in Washington, DC. The city was renovating the building and then it would be leased to Bayou Bakery, a well-known eatery in the area. Imagine our surprise and delight when we learned that the Bayou Bakery would be hosting the NBC Washington news crew broadcasting coverage of the inauguration events. In fact, the crew would be spending most of the day enjoying the atmosphere of the conservatory. In their regular broadcast the night before, NBC Washington did a story on the Bayou Bakery and we were shocked to find our crew featured on television. You see, some of the images that NBC Washington used to produce the piece showed the conservatory being constructed. The people you see working on the conservatory are Conservatory Craftsmen’s crew. Watch our video below that shows an edited version of the broadcast with a couple of photos that we added on at the end. By the way, the paparazzi have just been unbearable since this aired. Green plants in the house make the home seem alive and well. It brings a balance to nature and helps me pass the winter months with hope and anticipation to start it all over again. Actually, when the frost hits in the fall, I bring many plants into the conservatory (OK, quarantine to be discussed), I love having greens around for Christmas, but when January hits, I need to see my survivors. January is also the time for seed catalogs, plant lists for spring, and when I usually start herbs in the house, because I need to grow something! Let’s discuss where you could add more green in your home during the colder months. Identify the areas in your house where you would like to have plants. • The kitchen is a good place to start, but usually, there is not extra counter space here, so hanging plants may be the ticket. • Most bathrooms will also be short on space but long on opportunity. Plants love a humid room and in the winter, the bathroom is often that space. • Bedrooms tend to be a bit dark. For sake of privacy, most rooms have drawn curtains, so give this room a pass. • The family room and the dining room are good locations. • The front entry can be a cold spot when the door opens, so if you have a plant there, make sure it’s a tough character. OK, now we need actors for the stage. First… a warning. Most common plants we grow in the house are in some way not good for pets. A good rule is: if you can eat it, so can they. If you have pets, grow herbs. Always check the ASPCA list of lethal plants before bringing them home. You will be surprised at how long the list is. However, that said, most of these plants humans shouldn’t eat either! So be a bit cautious around young children. Many of the plants I am recommending for the average home are not good for pets. I consider it this way. If you don’t own a pet, you need something to take care of, right? Here are some players that you might consider. This is not, by any means, a complete list. • Spath (Peace) Lily. A nice dark green plant with a pretty flower. It’s easy to grow in low light situations. It does not like to be dry or overwatered, so just a regular small amount of water will do. • Spider Plant, a great hanging plant for any room in the house. It produces tons of oxygen, so it’s a good sleeping room plant. It also removes formaldehyde, benzene, xylene and carbon monoxide from the air. • Schefflera or umbrella plant, medium to high light. Is a broad growing (umbrella like) plant. • Aloe, a succulent, is well known for treating burns and sunburn but it also removes pollutants from the air in your house. All homes should have one. • English Ivy: needs more light than pathos ivy or philodendron but is renowned as being the most effective pollutant remover for the house. Very effective at removing formaldehyde from the air. • Rubber Plant, although not as popular as it once was, it is a very good plant for low light areas of the house and also removing pollutants from the air. • Dracena many varieties. It can get quite tall. Remarkable as it removes xylene, trichloroethylene and formaldehyde from the air. Plants that flower: Most take a bit of talent, these are the easy ones. • African Violet this plant can become habit forming. Grandma had many, many plants and varieties. They prefer less light when nothing else will flower. • Boston Fern: For those of you who hate the mess an indoor plant may leave behind, avoid plants such as Boston Fern when you see them on sale at the home improvement store. Although beautiful and not difficult to grow, it sheds like a black lab in July. So be warned, it is a high maintenance plant. Another homeowner concern that I read on the internet is that of temperature control in the conservatory. Funny thing, I never see that objection about a new Lexus or Mercedes! Couldn’t you say the same about them? Oh, but one thing, you assume the manufacturer has considered climate control in the vehicle, and you will always be comfortable. I guess the ‘sunroom’ industry has deserved the bad rap it has earned. Too often, a sales guy, eager to close a ‘deal’ will do so with no consideration or discussion about climate. That is a different company than Conservatory Craftsmen. Ask anyone who has worked with us. The discussions are long and detailed about how the conservatory is going to be used and what are the expectations of the homeowner. Let’s start with the plants. When building a greenhouse, we assume all owners of a conservatory are going to grow some plants. 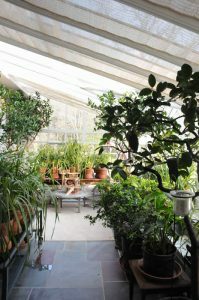 Some people build the conservatory because they want to grow a serious crop of citrus and vegetables. Others want to enjoy sitting in the starlit evenings with the fragrance of Meyer Lemon filling the air. Either way, I have to make sure the humans and the plants can co-exist. Conservatory Craftsmen has been building conservatories in Minnesota for over 25 years. Does that say anything? We use these rooms 365, and my customers are happy. Plants never sleep. Keep a door between the house and the conservatory. In the winter, when it’s below zero, the conservatory should not be kept at 70 degrees while you are in bed sleeping. 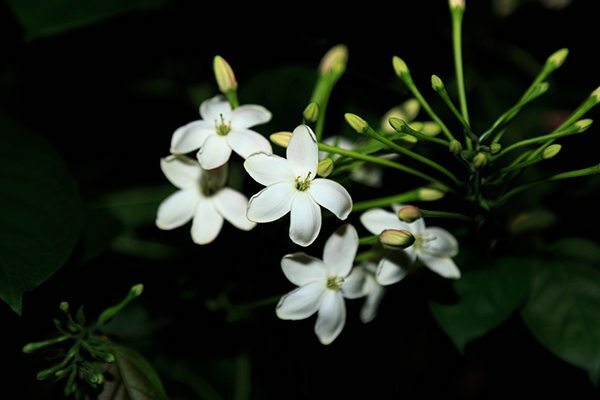 Plants respire at night, they have no sun so they change their activity from photosynthesis. They don’t want it to be 70 and dark. They grow long and leggy looking for the mythical sunshine that only lasts 8 hours in Minnesota. Thermostat. 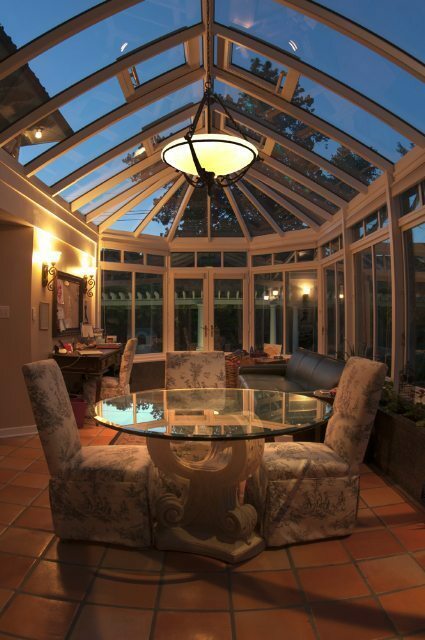 The temperature of your conservatory should be set 45 to 50 degrees at night. Heat Sinks. One of my customers has several ‘heat sinks’ going in their conservatory. Water columns hold heat and can be fun. Trombe walls and heat sinks all help to hold the day’s free heat into the night. This very customer is also a professor of engineering at the University of Minnesota. He keeps very close track of the energy consumption of the conservatory and tells me he has never spent more than $40 in any month of heating in Minnesota. My heating bill is more than that, but not crazy. We will spend as much as $250 in the winter to heat the entire home, conservatory and our hot water in the worst month of winter (ok, I admit, I have a heater in the garage set at 40 degrees too). That is less than many spend on just their homes. Insulation. I will honestly say, the high-tech insulation and thermal efficiency of our conservatories make them easy to heat in the winter. You should never say ‘it’s too cold to use the conservatory today’. Cooling, however, requires discussion also. One cannot build a conservatory and expect to cool with air conditioning. That is not a responsible choice. Here is how we manage summer climate. Plant a tree. If you are on the south or west exposure, you need shade. The beauty of a shade tree is that it is a natural, free air conditioner that loses its leaves in the winter and provides plenty of sun and warmth that time of year. Use efficient glass. There is a battle between plants and humans when it comes to glass. We will have that discussion when planning the room. However, we can achieve great things with the glass we use, so chat with us about high-efficiency glass. Blinds. We offer blinds for sloped glazing. We have the best products in the world for conservatory roofs. Our blinds can be manually operated or they can be automated to work themselves when it becomes too hot or sunny. Move air. Commercial greenhouses don’t air condition. They move air and lots of it. Chat with us about air movement and how we can help you design a system to exchange the air in the room all day long. In the winter, capture that air for your house, in the summer; exhaust that air to the outdoors. So, you naysayers who scribe on the walls of Houzz speak not from the hip, but talk to us and you will enjoy your conservatory, and the weather, any day of the year. The price of things seems to be higher these days, particularly at the supermarket, which is at least a weekly journey for most families. But what if I told you that you could skip those checkout lines entirely or at least reduce your bill by growing your own food? Don’t have the time, the space, or the desire? 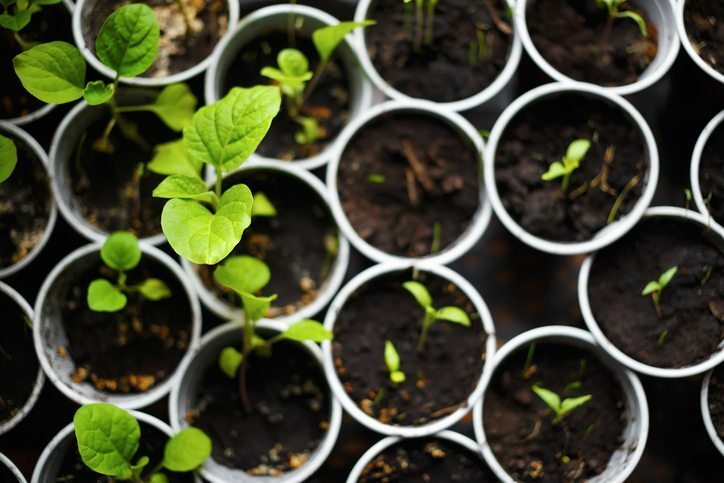 Take a look at these 5 benefits of growing your own food at home; they may persuade you to reconsider. Did you know a packet of seeds is less than a dollar? You can also preserve, dry and can some of your summer crop to enjoy the whole year round. Watch as your grocery bill gets lower and lower as you begin to fill your kitchen with fresh produce right from your own greenhouse. It’s a pretty well-known fact that eating fruits and vegetables is one of the most important things you and your family can do to stay healthy. Fruits and vegetables are packed with vitamins and minerals that not only improve your health but can even prevent disease. Have a supply of fresh food right on hand increases the likelyhood that you’ll grab for them when you’re considering what to eat. 3. No more worry about food safety. Imagine the world where you can trust that your food you are feeding your family is safe and healthy to eat. When you grow your own food, you are in complete control, you don’t have to worry about any recalls, exposure or contamination that could have happened on that tomato’s journey from the farm, to the factory, to the grocery store; to your table… You simply grow it, pick it and enjoy! 4. Reduce your carbon footprint. Growing a garden is not only good for you; it is also good for the planet. Think about how many miles your food has come to get from the farm to your kitchen table. By growing at home, you are drastically reducing the use of fossil fuels and the resulting pollution that comes from the journey of fresh produce that could come from across the world by planes and refrigerated trucks.Home gardening helps the planet in many ways. If you choose to grow organically, you will also save the earth of any air and water pollution that comes from pesticides. Nothing tastes better than fresh fruits or vegetables straight off of the plant. Although they will probably not be the perfect shape or the perfect color, get ready for a taste explosion that will have you vowing never to eat those rosy red commercially raised tomatoes from the grocery store again! Having a conservatory, greenhouse, or garden room provides a place for you to grow your food year-round while having complete control over the growing environment. You’re no longer dependant on the weather, or having to worry about wildlife and pests destroying your hardwork. So whatever your reason for creating your indoor garden, rest assured that your body, your wallet and the planet will thank you! Interested in how we can build you a conservatory or greenhouse that uniquely fits your home and your style? Contact us today, and we’ll help turn your dream into reality! The natural resources of the world, though abundant, are being threatened by climate change and global warming. As a result, people are becoming more aware of their carbon footprint; how much energy we consume, the environmental factors in which their food is grown, and how to incorporate it all into our everyday life. A conservatory or greenhouse is where lifestyle meets practicality and sustainability. When planning a home renovation, consider a conservatory or greenhouse. Traditional orangeries that originally functioned only as a place to grow plants and flowers have evolved into truly unique spaces in which to live. Conservatories and greenhouses are as custom as any other room addition; specialty muntins, hand woodworked details and stained glass makes each crystal palace one of a kind. Temperature control features keep the room comfortably tempered, without adding to electricity bills. Before anything else, you need to determine what you’re using the space for. Understand the size your property can accommodate, and how the design will work with the existing structure of the home. Now that you know what you want and what purpose the addition is for, you need to map out your plan. Communicate openly and regularly with your builder; make sure that all payment installments are in writing, and that expectation is set in terms of time to completion. In setting up a budget, make sure it is realistic and within your means. This is a complicated process as the budget can restrict the whole process. Get quotes from several trusted contractors and understand the cost of labor in relation to the cost of materials. 4. Hire the right people. Ask for as many references and feedback as you can before handing over any deposits. Check for negative feedback and complaints as well as certifications. Your choice will depend on your goals and budget, but there should be a long line of clients willing to offer a recommendation. Because you hired the right people, this step, in theory, should be unnecessary. But the reality is that big projects with many details can run into unforeseen issues. Make sure to set aside a few extra dollars for unexpected problems. As energy costs continue to rise and environmental concerns grow, it helps to start thinking about ways on how you can minimize your home’s daily energy consumption. There are now ways for you to conserve and offset the amount of non-renewable energy your household uses on a daily basis. There are also ways for you to generate your own electricity so you won’t have to be entirely dependent on the power grid. 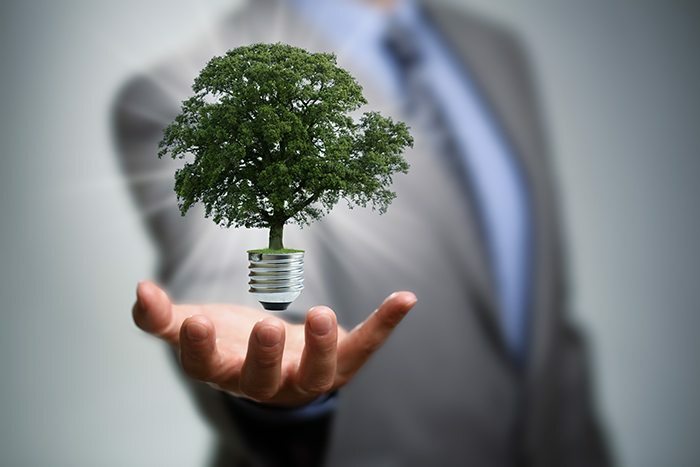 Here are five ways to conserve energy in your home. 1. Harness the power of the sun. One way to reduce your daily power consumption is to use solar power as an alternative source of energy. Among alternative and renewable sources of energy, solar is one of the most popular and easily accessible. To harness the power of the sun, photovoltaic solar panels store a bit of excess energy on a rainy day. While function is paramount, homeowners are incorporating them to work with the overall design of the home.Using solar power has numerous benefits. Not only does it help you minimize your daily power consumption, it also allows you to save money on utility bills. It also lets you qualify for tax incentives because solar power enables you to reduce your carbon footprint. Instead of turning up the air conditioning, consider installing shades or blinds in your windows. Shades and blinds, which can be automated for ease of operation, reflect solar heat away from your house on a hot day. In the winter months, that same technology retains heat. Instant climate controls without the high costs. Using geothermal heating and cooling is another way to conserve energy in your home and reduce your electricity costs. This system relies on a pump to circulate water through underground pipes. Through the Earth’s natural temperature, your water supply will be naturally cooled in summer and heated in winter. Passive solar heating is the benefit of southern facing windows, which capture the heat and sunlight all year round. This heat is distributed in the rooms nearby, therefore reducing your daily energy consumption. If your conservatory or greenhouse is built on the south side of the home, planting trees outside will offer shade in the summer. In the winter when the leaves fall, the sun will be able to reach the windows and the heat will be trapped inside. 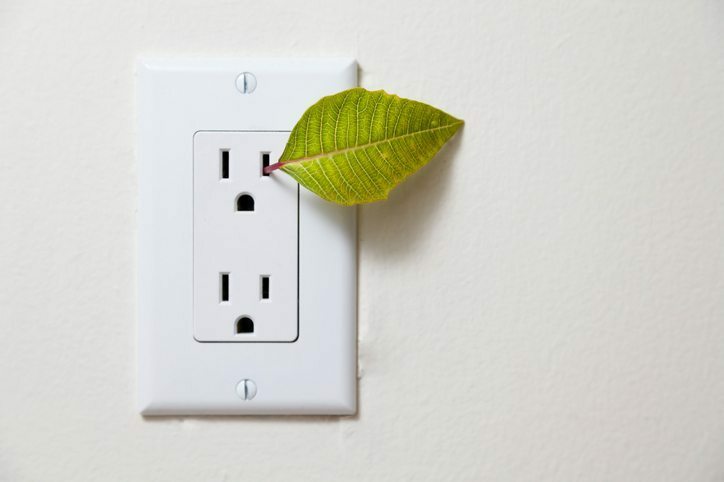 Perhaps the simplest and the easiest way to conserve energy in your home are to switch off and unplug all household appliances when they are not in use. As long as they are plugged in, electronic devices will continue to consume electricity even if they are in standby mode. Unplugging home appliances and electronic devices as a habit will reduce your daily power consumption. Our most recent project in Kansas City, MO was a bit of a tricky one. We were tasked with installing a 3-bay, mahogany conservatory in the ‘L’ of a house while ensuring that rain and excess water would indeed flow away from the room. With innovative materials and design. This project was a success! The spacious interior is a perfect gathering spot for friends and family. The inside ‘L’ takes on a dramatic effect while gazing up at the historic brick home. Did you know that Kansas City has the most public fountains in the United States? The conservatory is the perfect choice to enhance the classic brick home. Can you imagine how tempting the pool was when we were on site given the 100+ heat Kansas City experiences each summer? However, we trust that our clients are staying cool, sipping wine and taking in their lovely view of the stars.